I had a hankering for flapjacks, those gooey chewy oaten morsels that couple so well with an afternoon pot of tea. During summer I rarely crave such rich, bolstering fare. However, given that the sunshine seems to have rudely stood us up this year in the Pacific Northwest and a dull chill lingers in the air, I decided that flapjacks were perfectly fitting. They are also ideal for those times when you want to bake something lovely—to fill your home with the redolence of honey, grain, and spice—but can’t quite work up the energy for an elaborate concoction. Flapjacks take all of ten minutes to prepare, requiring nothing more strenuous than melting butter and sugar together and languidly stirring in some oats. The only trouble with flapjacks is the need to restrain your greed: they cannot be eaten straight from the oven as they will fall to pieces if attacked before cool. Yesterday I was, as usual, unsuccessful in the restraint department and ended up eating flapjack crumbles with a fork. Ah well, it may have been a bit messy but tasted just as good. Later, feeling the need to sample the cooled version as well, I ate a flapjack too vigorously and it wrenched a filling from my tooth. So I was doubly punished for greediness and now cannot eat any flapjacks because of the gaping hole in one of my molars. So beware, flapjacks are easy to make, delicious to eat and ostensibly innocent but they have a dark side. Eat with caution. A twist on classic flapjacks, these are chewy and sweet with a vibrant gingery kick. 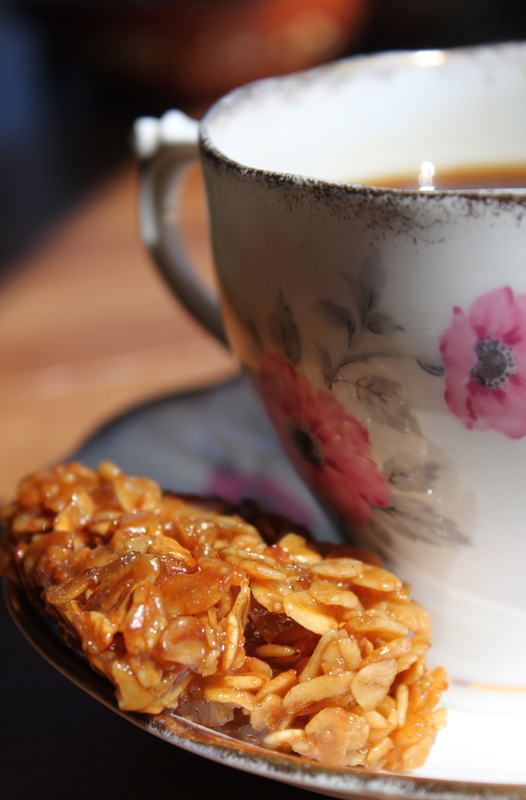 Enjoy with a cup of strong tea or coffee on a grey and blustery day. 1. Preheat the oven to 350F/175C and grease an 8-inch square baking tin. 2. Melt the butter, sugar, honey and molasses together over a low heat. 3. Add the oats, salt, spices and crystalized ginger and mix well. 4. Tip into the baking tin, smooth the top and bake for 20-30 minutes until bubbly, dark golden and browning slightly at the edges, (covering with foil if it begins to brown too soon). 5. Allow to cool for an hour or so and cut into squares.